Why: To celebrate World Water Day and support Lee Oneness Foundation’s clean water initiatives. Who: Sign up as an individual walker, as a family, or gather a group of friends, co-workers, or classmates together and form a team to raise funds and awareness for The Kawangware Project’s well drilling projects. 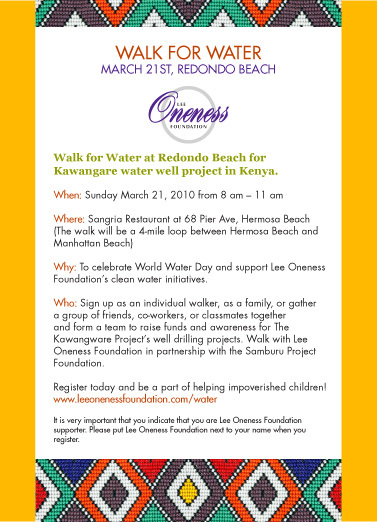 Walk with Lee Oneness Foundation in partnership with the Samburu Project Foundation. Important: It is very important that you indicate that you are Lee Oneness Foundation supporter. Please put Lee Oneness Foundation next to your name when you register. All participants of Lee Oneness Foundation must check-in at Lee Oneness Foundation desk on March 21st before 8am.